In the first section, we discussed basic fire alarm control panels that contain one or more initiating circuits and notification appliance circuits. Now we will discuss the devices which place a system into alarm. 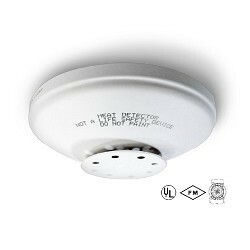 Initiating devices commonly used to activate the initiating circuit of a fire alarm control panel are: heat detectors, smoke detectors, water flow switches and manual (pull) stations. Let's first look at​ heat detectors, which, like sprinkler heads are basically intended for property protection rather than for life safety. Heat detectors fall into two basic styles of protection: Line, and Spot detection. Line detection protects areas over an elongated path. Spot detection protects an area resembling the area lit by a spotlight. Line heat detection is less common, but is invaluable for protecting certain hazards. One of the most common line detectors in use today consists of a twisted pair of wires insulated with a thermal coating that has a specific melting point. If excess heat is applied to the cable, the insulation melts, the wires short circuit together, and the control panel goes into alarm. The system is restored by cutting out the damaged section of cable and splicing in a new section. A typical line detector is shown to the right. Other types of line detection make use of eutectic salts or similar insulation that is non-conductive until it reaches a specified tem- perature and then conducts current from one conduc- tor to the other. U n l e s s m a j o r damage occurs, the insulation again becomes non-conductive when the temperature drops, thus making this type of detection essentially self-restoring. Some older systems use copper tubing installed throughout the area, filled with air or gas under pressure. Diaphragm arrangements then respond to increases in pressure caused by heat, and close contacts, creating an alarm. no other sensors would function properly. Spot detectors cover a finite area that varies according to the rated sensitivity of the detector and the distance (height) of the detector from the floor. The most commonly used types of spot heat detectors are: Fixed Temperature, Rate of Rise, and Rate Anticipation detectors. Electronic (thermistor/microprocessor) detectors have been introduced fairly recently and may be used only with com- patible control panels, usually addressable panels. With the exception of the electronic versions, heat detectors are mechanical in nature, and contain contacts that close when the detector is in alarm, making them compatible with any conventional control panel. The fixed temperature detector goes into alarm ideally when the ambient temperature reaches a certain setpoint. The most commonly used fixed temperature detectors operate on two different principles: fusible alloy and bimetallic strip. The fusible alloy unit uses an alloy physically resembling sol- der, but with a much lower melting point. The most common temperature melting points are in the vicinity of 135o F and 190-200o F, depending on the manufacturer. The alloy holds a spring type mechanism in place. This mechanism holds a spring in an extended position keeping a set of contacts open. When the alloy reaches its melting point, the spring is released, allowing the contacts to close, placing the detector in alarm. The detector is usually non-resettable, and either the detector or fusible unit must be replaced after actuation. The picture below shows a popular fixed temperature detector with replaceable element.